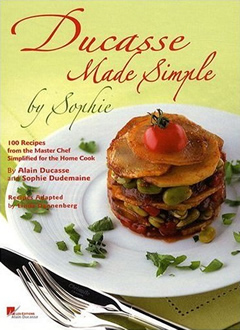 For a cookbook that hangs its hat on the simplification of its source material, Ducasse Made Simple by Sophie: 100 Recipes from the Master Chef Simplified for the Home Cook (buy at Amazon ) is awfully settled in advanced home cook territory. 100 select recipes from Alain Ducasse's epic Grand Livre de Cuisine (buy at Amazon ) were "simplified" by Sophie Dudemaine (who the New York Times called the "French Rachael Ray"), and then the recipes were "Americanized" by Linda Dannenberg. That's a lot of filters between the home cook and the original source, and there has been some outcry against the possibility that Ducasse food, simplified, could remain Ducasse food, actually. The chef's recipes and techniques are famous for their precision and technique — why do we feel the compulsion to simplify recipes that are, of necessity, complicated? So Is it Really Simple? "On a floured work surface, using a floured rolling pin, roll out the pastry dough to a 1/4 inch-thick rectangle. Using a 2- to 2 1/2-inch cookie or biscuit cutter, cut out 30 circles. Place 1 to 2 tablespoons of filling in the center of 15 of the pastry rounds. Moisten the edges of the rounds with water and top with the remaining 15 pastry rounds. Seal the edges by crimping with a fork or pinching with your fingers." "Using a pasta machine (ideally), roll out the dough to a 1/16 inch thickness. Or, on a floured surface, roll out the dough with a floured rolling pin into a rectangle approximately 13 by 22 inches and a 1/16 inch thick. The dough must be ultra-thin, and this is a challenge if working with a rolling pin; make sure both rolling pin and your work surface are well floured. Position the dough so that a short side faces you. Then, filling in the bottom half of the rectangle, spoon 20 walnut-sizes mounds of filling evenly spaced over the dough, 1 1/2 inches apart. If you are working with a narrower, machine rolled dough rectangle, you’ll need to make ten rows of two. If you’re working with 13 by 22 inch dough rectangle, make four rows of five mounds. Moisten the dough slightly around each mound, then carefully lift carefully lift the top half of the dough with a spatula and fold it over the bottom half, making sure the edges for the dough meet on all sizes. Gently press the dough together around each mound of filling with your fingertips. Cut the individual purses apart, then press with the tines of the fork to seal. 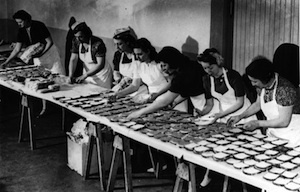 A slightly easier method of forming the purses — practical if you are not adept at working with the dough — is to cut the rolled-out dough into 20 individual rectangles approximately 4 1/2 by 2 1/2 inches. Place a walnut size mound of filling in the center of the right half of each. Very slightly moisten the edges of each rectangle, then fold the left half over the right and press all four sides closed with the tines of a fork to seal." Both versions contain roughly the same information: roll out some dough, fill it with pumpkin, cover it with more dough, and seal it. They even follow pretty much the same technique, apart from shape. The original, however, seems easier to me. It gives several options given what equipment you have and your skill in particular areas. Sure, the simplified version is shorter, and perhaps more straightforward in its language. But if home cooks are unsure of their ability in the kitchen, aren't they more likely to flourish when given proper instruction? Most of the recipes in the book are complex enough that I would feel duped had I bought it under the misapprehention that it was "accessible to every home cook." In fact, the alarmingly brief introduction is made up largely of a lengthy list of both equipment and pantry items that are essential to a Ducasse kitchen — guidelines that seem daunting even to my quasi-professional (albeit young) eye. The introduction even halfway fesses up to the necessary process involved in producing traditional French fare, stating "Note that several recipes in Ducasse Made Simple by Sophie involve elements that must be prepared a few hours, or even days, ahead of time." Simple? Really? This book is being sold on the promise made by its title, and the contents don't deliver. The recipes may be stellar in execution, but they're all a bit dated and heavy. Sold under a different heading, it may have been been an honest, good book. After all, didn't Julia Child make her name producing authentic French recipes that are accessible to the American home cook? The difference is in that word, "simple." I don't think anyone could accuse Child's famously lengthy baguette recipe of simplicity, but its adoption in the American home cook's repertoire was revolutionary. Dudemaine and Dannenberg are underestimating the American home cook's interest in properly preparing food; the shortcuts taken will frustrate, not educate. A cookbook has to offer something unique in order for me to feel comfortable recommending it, and this book is anything but. The recipes seem to be retyped, not reborn, and it doesn't deliver on its premise (if, indeed, delivering on said premise is even possible.) My recommendation is to buy Grand Livre de Cuisine, buy Julia Child, buy any number of books that explain French technique in all its original intended glory, and do it right. Even though it does, this book can't afford to cut corners, and neither can you.